Just a few minutes in a hot vehicle can harm or kill your pet. On hot days, the temperature inside a vehicle heats up to over 160 degrees in minutes. Parked cars quickly trap the sun's heat, and "cracking the windows" doesn't do much. Pets can't cool themselves the way humans can, and this makes them especially vulnerable to heatstroke. Too often, a neglectful dog owner goes into a store "just for a minute" only to find his dog dead in the car upon his return -- and such neglect carries serious legal consequences. In June, an eight-year-old German shepherd named Elisha died in Belmont, California after being left in a truck in a motel parking lot for seven hours. Dogs who are trapped in cars pant heavily, pawing at the glass of rolled up windows, trying desperately to avoid the heat of the sun. They may experience excessive thirst, vomiting, seizures, increased heartbeat, and elevated body temperatures of 104 degrees and higher. According to media reports, officers on the scene tried to revive the shepherd with ice and water, to no avail. Elisha's owner -- who was sleeping in the motel while the dog was in the truck with no water -- is being charged with felony animal cruelty. When an animal dies an excruciating death from negligence, writing off the tragedy as a simple accident is insufficient -- and criminal prosecution is just. 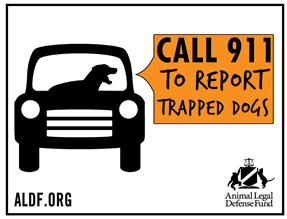 Fifteen states have specific laws against leaving animals confined in vehicles: Arizona, California, Illinois, Maine, Maryland, Minnesota, Nevada, New Hampshire, New Jersey, New York, North Dakota, Rhode Island, South Dakota, Vermont and West Virginia. Rhode Island's brand new law was signed by Governor Lincoln Chafee this summer and is one of the most comprehensive of these laws, with the strongest penalties -- up to a year in jail and up to $1000 in fines. Vermont also allows sentences of up to a year in jail, while Vermont and West Virginia allow up to $2000 in fines. Meanwhile, in the 35 remaining states, the anti-cruelty statutes often can be used to prosecute anyone who leaves an animal in a car to suffer or die. For example, under the California Penal Code, anyone who "overdrives, overloads, drives when overloaded, overworks, tortures, torments, deprives of necessary sustenance, drink, or shelter, cruelly beats, mutilates or cruelly kills any animal" can be charged with a felony. If convicted, the dog's owner could face up to three years in prison and a $20,000 fine. A 2011 AAA survey found that 56 percent of respondents said they had driven with their dog at least once per month in the previous year. Given that there are currently 83.3 million dogs living in American households that translates to 46.65 million dogs driven in cars each month in this country. Recently a woman in Florida was charged with a misdemeanor after her dog, Waldo, died as a result of being left for 13 hours inside her hot car in a Walmart parking lot. 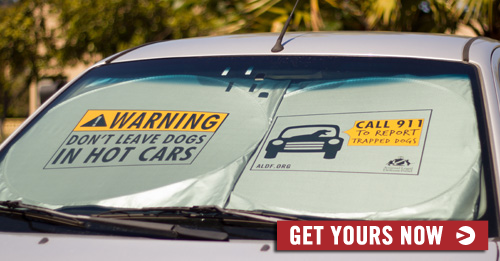 That is why this summer the Animal Legal Defense Fund introduced a windshield sunshade people can use to spread the message wherever they park. The design reminds passersby that cars can be lethal to dogs, even on mild days. The sunshades are available for purchase. 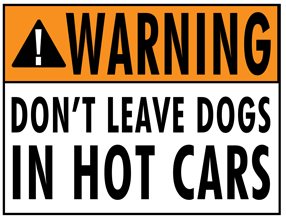 If you see a dog in a parked car on a hot day, try to locate the owner and let her know that the situation is urgent; otherwise, call 911. Even in states without specific legislation on this issue, law enforcement officers should do whatever they can to free an animal suffering in those conditions. Your action on behalf of an animal can be the difference between life and death.